At dawn, high above the tree line, a sleek grey potato of a bird whizzes through the air. As its stubby wings flap silently, it cries “keer keer,” then swiftly disappears into the trees. This strange and mysterious bird is the marbled murrelet. 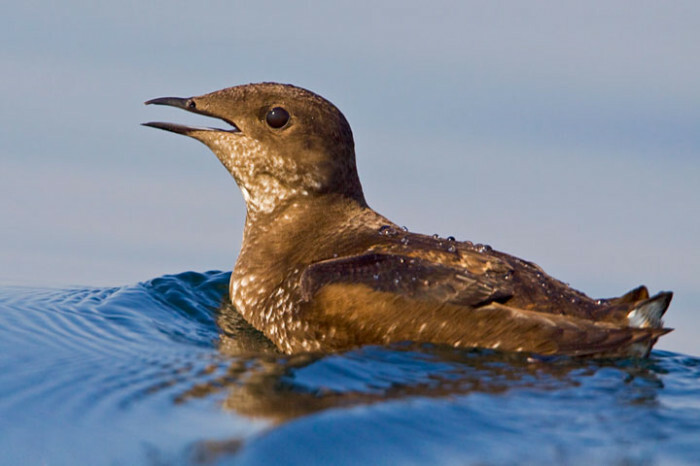 Unlike other seabirds in the auk family, the murrelet splits its time between open ocean and coast redwood forest. While its cousins, the murre and puffin, nest on coastal cliff sides and rocky outcroppings, the marbled murrelet insists on nesting in the tallest, oldest redwood trees — ones that have large, flat branches that provide mossy cushioning for a single egg. Not surprisingly, since murrelets depend on massive old-growth trees for nesting habitat, the species has become a poster child for coast redwood conservation. In February, Oregon’s Fish and Wildlife Commission voted to reclassify the marbled murrelet from threatened to endangered. Eventually, state agencies will need to draft new guidelines, which might include restrictions on logging, to help protect the bird on state lands. The vote is good news, considering that murrelets have lost an estimated 78,600 acres of nesting habitat in Oregon (external link) since 1993. By some models cited by the Oregon Department of Fish and Wildlife, the species risks an 80 percent chance of extinction by 2060 in certain parts of the state. While we know marbled murrelets are in serious trouble, it’s difficult to assess population trends for this elusive bird. Just ask the folks at the Oregon Marbled Murrelet Project (external link). Last year they began an ambitious project to monitor the murrelets’ whereabouts. In late April through May, researchers ventured into open ocean at night, to capture and tag healthy birds. Using radio telemetry to ping the tags, the team could track the birds’ movements in an attempt to understand their nesting habits. In general, marbled murrelets are famously difficult to track, since they’re either at sea or concealed by redwoods. The birds flit between these two worlds at dusk and dawn, when it is difficult to see their small bodies against a dimly-lit sky. “One day out foraging, one day inland — it’s the signal to indicate that they have a nest and they’re trading back and forth with their mate,” explains project manager Jennifer Guerrero. But out of 61 tagged birds, none of them apparently nested. Instead, many of them flew past the border to Canada, or as far south as San Francisco Bay. “Our hypothesis that we’re working on right now is that there was a decrease in fish availability last year, so maybe the birds elected not to nest,” says Guerrero. For now, the team does not have a definitive explanation. Researchers on the project are preparing for their second year of data collection, with captures and tagging beginning in late April. Until more data becomes available in the coming years, it will be hard to know the outcome for this small, redwood-loving bird. Hopefully, with a stronger designation in place, it will be a good one. Learn more about the elusive marbled murrelets and the League-sponsored research on their interactions with Steller’s jays in the Santa Cruz Mountains of California. For more stories on wildlife in the redwood forests, check out these posts on our Giant Thoughts blog. And if you’d like to try and see the murrelets in their old-growth redwood habitat, they’re particularly active early to mid-July. Big Basin and Prairie Creek Redwoods State Parks are good places to look for them in California.